Bruce Banner has a cold. Well, the flu, really. He gave it to himself, just to make sure he really can’t turn into the Hulk anymore. His snot is yellow, not green. A few weeks ago, readers witnessed a Hulk-free Banner struggling to figure out his own impulses and what a normal life could look like. The super-scientist has spent years trying to keep a lid on his emotions and being able to let go and truly take risks presents him with a new, altogether different kind of danger. In addition to trying to place reasonable limits on emotions he’s always suppressed, Banner is also struggling with forgiveness, for himself and others who’ve wronged him. Bruce’s journey to wellness continues in this week’s Totally Awesome Hulk #8—written by Greg Pak with art by Alan Davis, Mark Farmer, Chris Sotomayor, and Cory Petit—by way of self-administered chills and fever. Once current Hulk Amadeus Cho and his sister Maddie get Banner back to an old desert hideout, they start nursing him back to health. A pair of very familiar well-wishers come calling, but Amadeus is surprised to have Rick Jones and She-Hulk over for company since he didn’t invite them. As Banner recuperates, it becomes increasingly evident that he’s quieted the demons that fueled the Hulk’s rage, perhaps in a way that he’s never done before. He’s reckoned with his interior landscape and his external actions. Amadeus is in a different place, though. 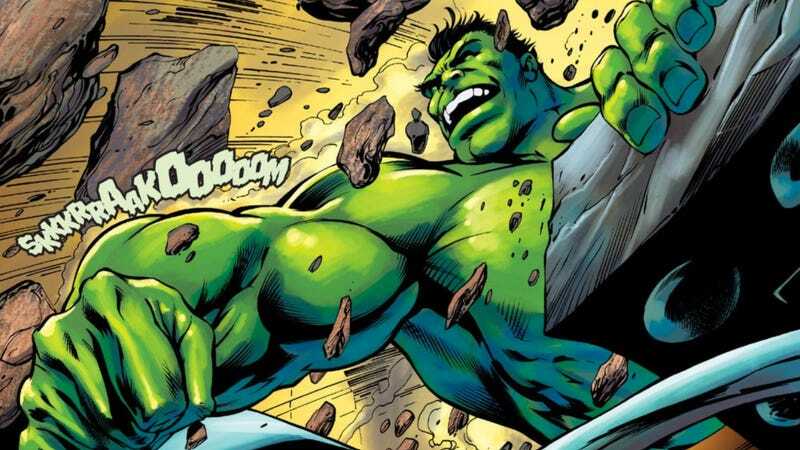 The newer, younger Hulk has been more brash and cocky than most other gamma-irradiated characters, as seen when he tests himself against the containment vault that Banner and Jones once used to keep the Hulk locked away. Amadeus has been blacking out while in Hulk form and committing actions that he’s not been in control of. Maddie’s big worry is that he isn’t doing the same kind of inventory, which is why she invited Rick Jones and Jennifer Walters to talk with her brother. It’s not quite as dire as an intervention, more like a meeting for Gammaholics Anonymous. When Amadeus finally breaks down and has a heart-to-heart with Bruce, it’s a quiet, gut-wrenching sequence that’s equal parts mentorship and therapy. Some fans have vociferously voiced their distaste for Amadeus Cho and this new chapter in the Hulk mythos. Moments like these may not win naysayers over but they do shine as exemplars of what’s possible when long-running superhero comics proactively evolve their mythos. Amadeus wanted all this power but struggles to integrate it into his life, a problem compounded by the distrust and misunderstanding he’s encountered so far. Pak is doing a stellar job at shaping Amadeus Cho into a very different sort of Hulk; this run is partially a commentary on what people need to do to love themselves when there’s a part of them that’s been rendered into a big, scary Other by society. The reaching out to peers and taking care of others are important steps to maturity for marginalized groups, young people (and genius scientists) who’ve otherwise thought they might have had to go it alone. Tragedy is around the corner for him—he’s a Hulk, after all—and the question now will be how he deals with it.